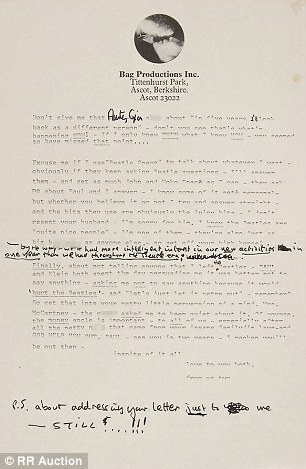 Una polémica carta que John Lennon escribió en 1971, atacando a Paul y Linda McCartney, después de la separación de los Beatles, fue vendida recientemente por treinta mil dólares a través de la empresa RR Auctions de Boston a un apostador que no revelo su nombre. 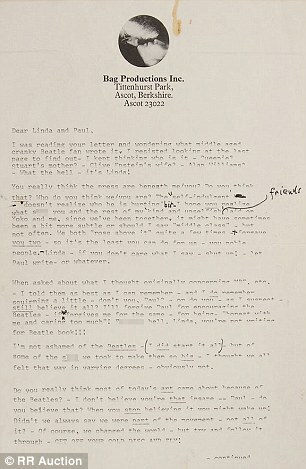 La carta, de dos páginas, está escrita en máquina de escribir y contiene algunas correcciones hechas a mano por el propio Lennon, quien arremete particularmente contra Linda McCartney y su familia a quien le hace una serie de reclamos bastante “subidos de tono”. La carta demuestra el grado de tensión y rivalidad que para ese momento existía entre las dos parejas que en lo sucesivo grabarían por separado. En 2014 McCartney comento que las diferencias entre Lennon y el habían sido un asunto de “negocios” y con el tiempo se normalizaron. Dijo que pocos meses ante de que lo asesinaran, Lennon y él habían rescatado su amistad y solían conversar frecuentemente por teléfono, algo de lo cual se siente particularmente bendecido. La carta fue escrita justo antes de que Lennon se mudara a Nueva York y forma parte de un lote de 300 manuscritos del músico perteneciente a la empresa privada llamada Profiles in History. Una copia de la misma vio la luz pública por primera vez hace tres años en un libro titulado “Las Cartas de John Lennon” que publico el escritor Hunter Davies el mismo que en 1968 publicara la única biografía autorizada del cuarteto de Liverpool. I was reading your letter and wondering what middle aged cranky Beatle fan wrote it. I resisted looking at the last page to find out - I kept thinking who is it - Queenie? Stuart's mother? - Clive Epstein's wife? - Alan Williams? - What the hell - it's Linda! You really think the press are beneath me/you? Do you think that? Who do you think we/you are? The 'self-indulgent doesn't realize who he is hurting' bit-I hope you realize what s**t you and the rest of my 'kind and unselfish' friends laid on Yoko and me, since we've been together. It might have sometimes been a bit more subtle or should I say 'middle class' - but not often. We both 'rose above it' quite a few times - & forgave you two - so it's the least you can do for us - you noble people. Linda - if you don't care what I say - shut up! - let Paul write - or whatever. When asked about what I thought originally concerning MBE, etc. - I told them as best as I can remember - and I do remember squirming a little - don't you, Paul? - or do you - as I suspect - still believe it all? I'll forgive Paul for encouraging the Beatles - if he forgives me for the same - for being - 'honest with me and caring too much'! F**king hell, Linda, you're not writing for Beatle [sic] book!!! I'm not ashamed of the Beatles - (I did start it all) - but of some of the s**t we took to make them so big - I thought we all felt that way in varying degrees - obviously not. Do you really think most of today's art came about because of the Beatles? - I don't believe you're that insane - Paul - do you believe that? When you stop believing it you might wake up! Didn't we always say we were part of the movement - not all of it? - Of course, we changed the world - but try and follow it through - GET OFF YOUR GOLD DISC AND FLY! Don't give me that Aunty Gin s**t about 'in five years I'll look back as a different person' - don't you see that's what's happening NOW! - If I only knew THEN what I know NOW - you seemed to have missed that point…. Excuse me if I use 'Beatle Space' to talk about whatever I want - obviously if they keep asking Beatle questions - I'll answer them - and get as much John and Yoko Space as I can - they ask me about Paul and I answer - I know some of it gets personal - but whether you believe it or not I try and answer straight - and the bits they use are obviously the juicy bits - I don't resent your husband - I'm sorry for him. I know the Beatles are 'quite nice people' - I'm one of them - they're also just as big b*****ds as anyone else - so get off your high horse! - by the way - we've had more intelligent interest in our new activities in one year than we had throughout the Beatle era. P.S. about addressing your letter just to me - STILL….!! !